WHAT A PARTY FOR 1008! 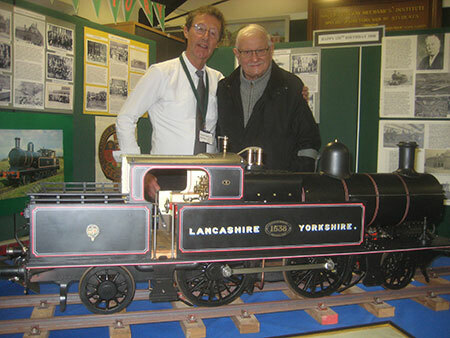 Chairman Stuart Whittle with Jim Unsworth who worked on the restoration of 1008 60 years ago. 100 people turned up on an awful day weather -wise to enjoy our display of photos and artefacts including a model of 1008 itself, a splendid large scale model 2-4-2 tank engine (originally built by Norman Lowe) brought along by current owner Richard Prideaux and the Leyland Model Railway Society, film of old Horwich locos, the 1008 song performed by Horwich Folk and of course birthday cake! Our special guest was 76 year old Jim Unsworth who actually worked on the restoration of 1008 at Horwich Works 60 years ago. 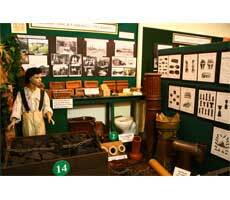 If you missed the opening, you can still see the exhibition at the Heritage Centre which runs until May. It is 180 years this year since the infamous 'Murder on the Moor' took place and Horwich Heritage are commemorating this event with a meal and re-enactment of the trial of the alleged perpetrator, James Whittle, at the Blundell Arms on Wednesday 17th April 2019. The circumstances surrounding this crime have always remained a mystery but the fact remains that a 20 year old packman, George Henderson, was murdered on his way across the moors above Horwich on 9th November 1838. He had been shot and was found dying in a ditch but he had not been robbed. James Whittle was the prime suspect, since he was spotted with a loaded gun in the vicinity and, following an Inquest at the Moorgate Inn (now the Blundell Arms) on 13th November, he was sent for trial in Liverpool. 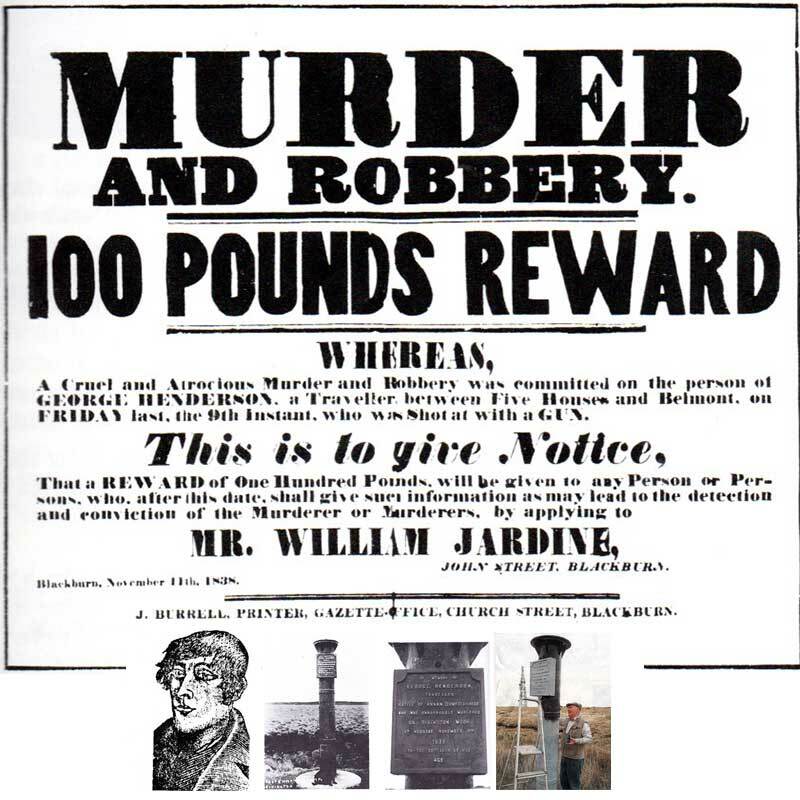 At the end of the trial in April 1839, Whittle was acquitted due to the unreliability of the witnesses, who may well have been influenced by the £100 reward on offer (a substantial amount in those days). No one else was ever charged with the murder and the event was commemorated for posterity by the placing of a cast iron column at the site. That column is still there today and is a well-known local landmark known as the Scotsman's Stump. To mark this year's anniversary, Horwich Heritage has carefully restored the stump so that it can remain as a lasting reminder of this tragic event for many years to come. "Our event on Saturday 10th November 2018 was a great success with over 300 people attending the Horwich Heritage full day of commemorations marking the centenary of the end of WWI. The morning exhibition of WWI displays and memorabilia also included the launch of a new book Horwich on the Home Front (1914-18), a display by Horwich Art Society and the unveiling of a specially commissioned piece of WWI artwork by 14 year old Morrigan Atherton. The afternoon highlights included the play 'Flanders to Fish' by the On the Go Theatre Company and the singing of patriotic wartime songs by the Horwich Community Choir.' 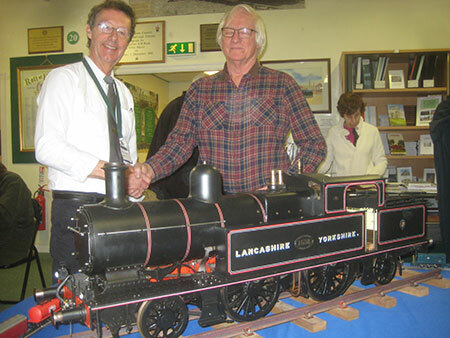 For those still wishing to visit the exhibition it runs until the New Year"
Horwich Heritage was formed in 1985 following a series of public meetings aimed at re-establishing a sense of local pride in the wake of the closure of Horwich Locomotive Works the previous year. The Society first began holding its meetings in the Public Hall, moving to Horwich Resource Centre in 1990 where its monthly meetings still take place. It opened its first Heritage Centre within the Resource Centre in 1995 and moved into its current premises in 2006. It gratefully acknowledges the support given by Horwich Town Council, Bolton Metropolitan Borough Council and the Resource Centre in the development of its activities. Membership currently numbers around 200 and the Society not only runs its own Heritage Centre and meetings but produces its own books and DVDs on subjects of local interest. To stimulate public interest in and appreciation of our area. 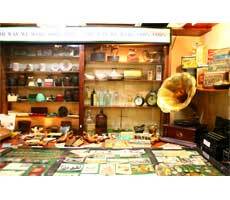 To provide suitable premises for the display of social and industrial history. To secure the preservation, conservation and improvement of features of general or historic interest. To promote tourism and encourage use of the surrounding countryside as part of a heritage framework. To encourage research into the history of Horwich and Rivington and to publish the results. To provide a social and educational service, giving advice and information and to act as a coordinating body to cooperate with local services. To raise funds to enable the pursuit of our objectives. On this website you will find details of how to become a member Horwich Heritage, dates of forthcoming meetings and events, a list of publications available frm the society and information about the exhibitions and archives at the Heritage Centre. 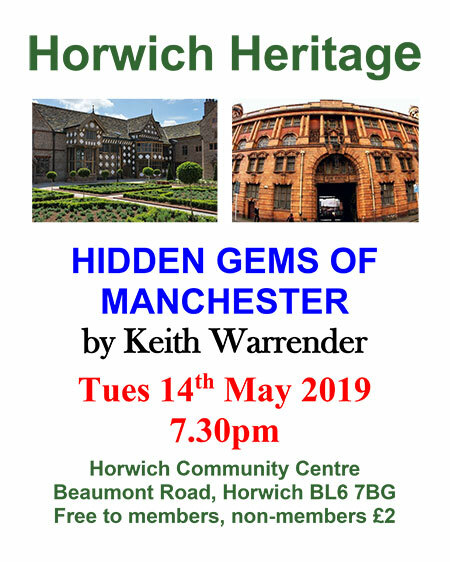 As the Society approaches its 34th year, we look forward to further developing our activites based on our much-admired Heritage Centre where we have the opportunity to do justice to the rich and varied history of Horwich and all the people who have helped to make us so proud of the town today. We hope you find that Horwich Heritage has something to offer and welcome your interest, suggestions and support. A Happy New Year to you all! 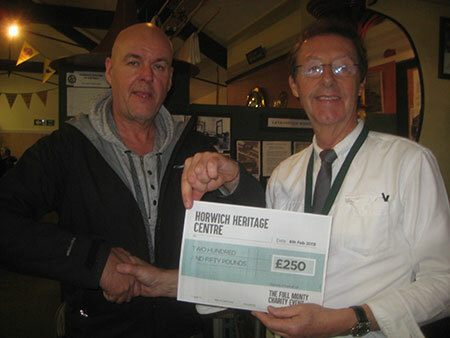 Let's hope its another good one for Horwich Heritage and its members and supporters. If you look at the programme, you'll see that we have lots of things planned and, as you'll see below, we have embarked on a number of projects which require your help - so we very much look forward to hearing from you! Best wishes, Stuart Whittle. • We start our 2019 Open Day/Exhibition programme with a celebration of the 130th birthday of Horwich's first steam locomotive on Sat. 16th March (10am - 1.00pm) - please join us for a piece of birthday cake! 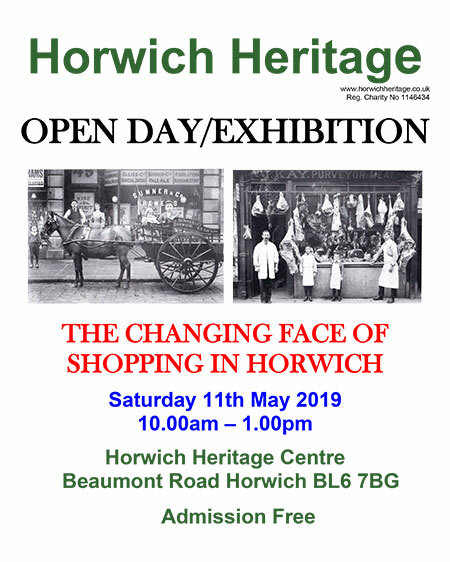 • We have also begun researching our first major project of the year 'The Changing Face of Shopping in Horwich' and would welcome any contributions of photographs, items or memories in time for our Open Day/Exhibition on 11th May. 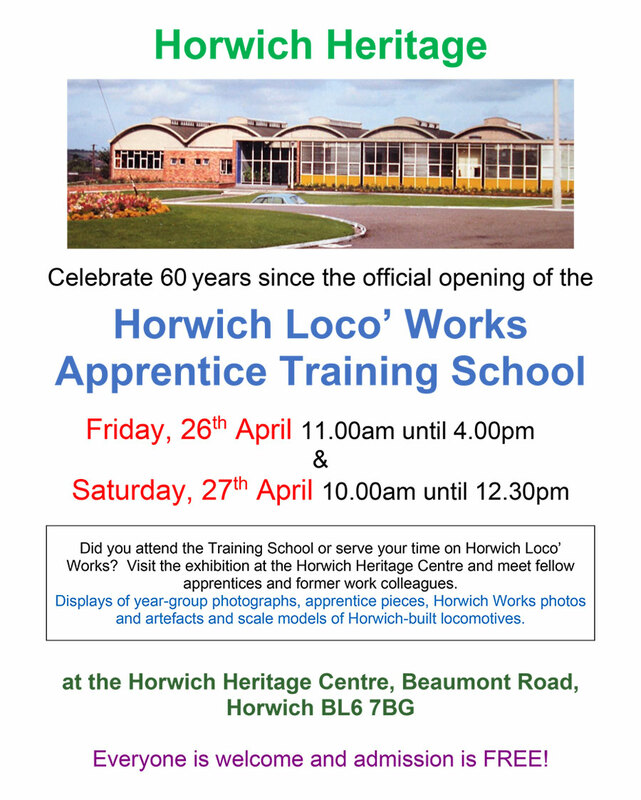 • This year marks the 60th Anniversary of the opening of the Loco Works Training School (now Alliance Learning) and in April we are planning a re-union of former apprentices/trainees. If you are interested in coming along please ring 847797or contact us via Facebook. • Our 2nd major research project this year involves the commemoration of the 80th Anniversary of the start of WWII in September and we would love to hear from anyone who was a child in the war or had relatives who served or fought (or maybe served/fought themselves!). 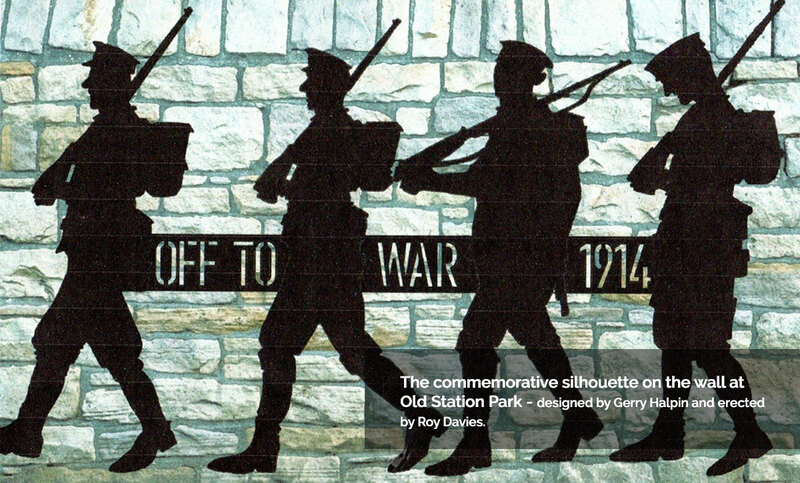 We are currently compiling a Roll of Honour for those who died. As part of our service to the public of Horwich, we are looking to expand our rota of Volunteers who look after the Horwich Heritage Centre, so if you can spare just a couple of hours a month and are interested in local history, please contact Les Duckworth on 696799. Our 2019 programme has now been finalised, featuring our popular Open Days, Monthly Meetings and Joining Information.